It might seem there was very little left to say about the rise in atmospheric CO2 due to anthropogenic emissions. But the other day my colleague Martin sent me a link to two presentations at the Scripps Institute ‘Home of the Keeling Curve‘, and I found out there was plenty left to say. Scientists there presented data which actually evaluated the things I have heard people chat about for years. The first topic covered was changes in the isotopic composition of the carbon dioxide in the atmosphere. This change unambiguously links the rise in CO2 to anthropogenic emissions – in case anyone really doubted that. The second topic covered was the corresponding decline in the oxygen concentration of the atmosphere caused by burning all that CO2. Carbon is made primarily from two stable isotopes: C12 with 6 protons and 6 neutrons, and C13 with 6 protons and 7 neutrons. The heavier C13 comprises only about 1% of natural carbon. As was first observed in 1961, plants preferentially build their cells from C12 based molecules. Thus fossil fuels, which are derived from plants, have a slightly reduced ratio of C13 to C12. 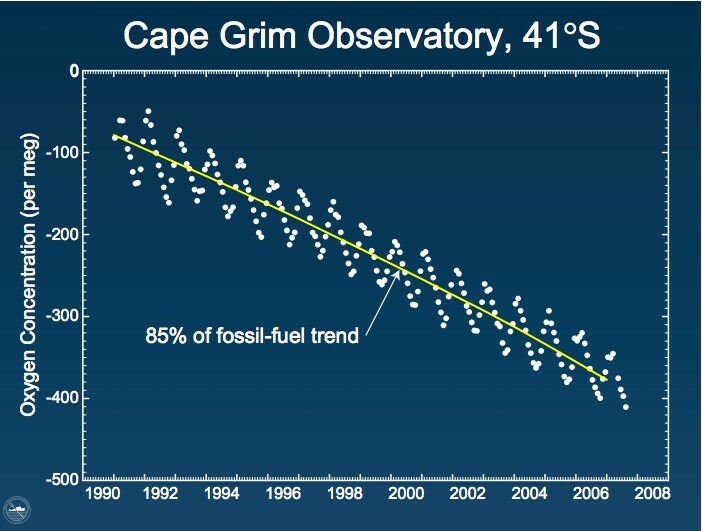 Thus if the increase in the atmospheric CO2 that we have observed is really due to the emissions from fossil fuels then we should observe a corresponding decline in the ratio of C13 to C12 in the atmosphere. The Figure at the head of this article shows the data, and more detailed graphs are available at the Scripps site which explains the different curves and dots on the graph.What I found pleasing was just to encounter this data that I have heard people chat about for years. 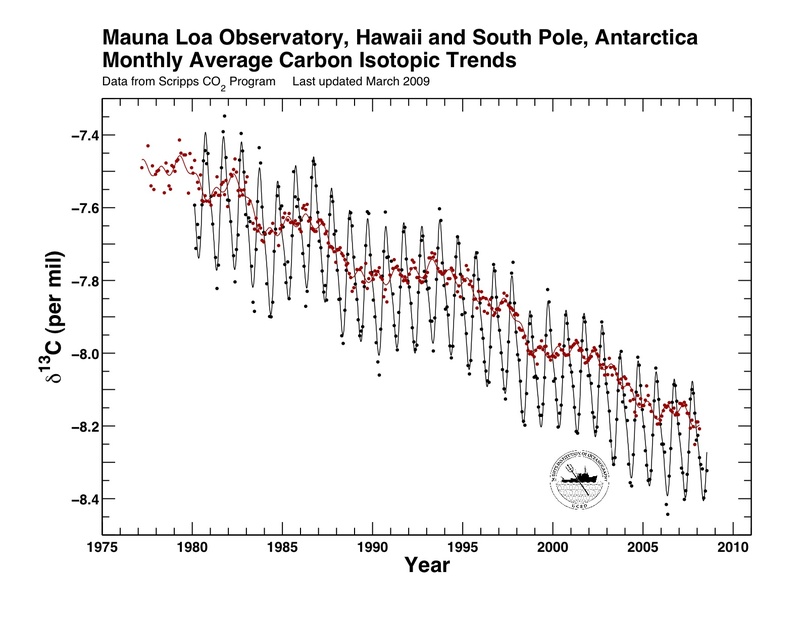 One natural consequence of the reaction C + O2 → CO2 is that the amount of oxygen in the atmosphere must be decreasing. Its a small effect but once again the people at Scripps have measured the effect and made calculations to determine that the effect observed is in line with the observed CO2 emissions. The relevant data shown above and can be found several slides into this pdf presentation. And so it is 10:48 p.m. and time for bed. But I feel the need to comment, that what I really admire about the data in these presentations is that they are so basic. Somehow people have scrabbled together enough funding to keep the measurements going for long enough for someone to recognise their profound importance. This is IMHO really admirable science. Goodnight.